If you are joining the class on March 14 for a condensed series of classes it would be helpful to have some knowledge of paper piecing. 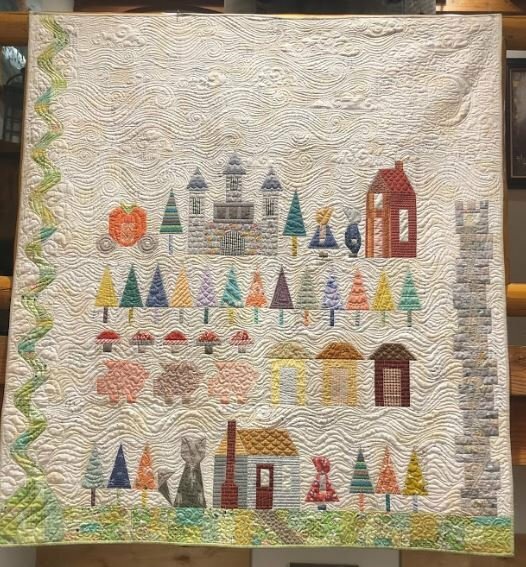 This highly anticipated class is now available That Fairy Tale Quilt, by Lucy Carson Kingwell, has all of the adventures that fairy tales bring. Join our instructor, Mindy Mounteer as she helps you through the beloved tales of The Three Little Pigs, Little Red Riding Hood, Cinderella and more. The adventure begins with paper piecing and piecing these blocks together. Soon you will have a quilt that will treasured for many years to come. Let the adventure begin! Note: The last class is a Saturday, 4-hour finishing class. This will help you finish your quilt with the ever popular scrappy background, bringing all the tales together.